Lexington Tango - contemporary Argentine Tango classes and events. 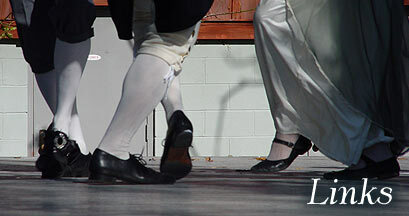 Lexington English Country Dancers - Regular social dance on Monday nights and a monthly dance at ArtsPlace. Centuries Dance - Under the leadership of Renee Camus, this group in the Washington, DC, area is available for performances, parties, educational presentations, workshops, and teaching events. Commonwealth Vintage Dancers - The Commonwealth Vintage Dancers (Boston, MA) sponsor the famous Newport Vintage Dance Week in August. Ensemble Aquarelle - Founded by Margarita Marambio, this group in Montreal and Quebec specializes in the promotion of ball dances from the early 19th century up to World War I. Flying Cloud - The Flying Cloud Academy of Vintage Dance (Cincinnati, OH) - where it all began. Forget-Me-Not - This historical dance company (Cincinnati, OH) recreates the social dances from American colonial times to World War I. Grand Traditions Vintage Dance Academy - The Grand Traditions Vintage Dance Academy (Ann Arbor, MI) offers classes, workshops, and balls, focusing on dances from the mid-19th through mid-20th centuries. Mixed Pickles - Mixed Pickles is Philadelphia 's vintage dance company. Tapestry Historical Dance - dedicated to the research, re-construction and performance of historic social dance. The group's repertoire encompasses historical eras from the late 15th through the mid-19th centuries. Triangle Vintage Dance - dedicated to providing Vintage Dance events as well as Waltz events for the Triangle area (Raleigh/Durham/Chapel Hill) of North Carolina. Victorian Dance Society - The Victorian Dance Society of the Amherst Museum (Amherst, NY) meets twice a month, holds an annual ball, and performs at Museum events. Victorian Events Calendar - This is John Burrow's calendar of vintage events of the Victorian Era. Vintage Dance Society - The Vintage Dance Society (Hartford, CT) has a new web page with information about events, performances, music, costume, and more. YS Dancers - In Yellow Springs, Ohio, this group enjoys all the English and American dances from 1600 to 1900---country dance, waltz, schottische, etc.---with regular classes and period balls. Dancetime Publications - Dancetime Publications is one of the top online dance history resources, providing instruction, historical context, and edu-tainment for dance lovers. Through our DVDs, avocational dance lovers, dance professionals, researchers, choreographers, students, and teachers relive the music, fashion, and movement patterns that comprise the heritage of Western dance. The Black Tie Guide - A gentleman's guide to evening wear from the Regency Era on. Civil War Lady - Mail order and custom-made clothing for women. Authentic 1860's styles and construction. Commonwealth Dancers Regency Costume Pages - Advice on "faking" men's and women's regency costume for a ball. Costume Gallery - "A Central Location on the Web for Fashion and Costume since 1996." Costumes History - On-line version of The History of Costume. This site has lots of pictures of costumes from ancient times to 1880. Jessamyn's Regency Costume Companion - Pictures and discussion of men's and women's costume from Regency period. Includes links to site for other periods. History in the Making - Site offers men's and women's reproduction period costume and accessories. The catalog includes custom-made articles of 19th century clothing, hats, bonnets, wigs, neckwear and other assorted items. Originals by Kay - Kay Gnagy makes custom vintage clothing for men and women. She specializes in the Civil War Era. Sensibility - Chancey sells patterns for vintage women's clothes---Regency, Edwardian, Ragtime, Swing.